Dustin’s birthday was on Tuesday and for us that means steak night. Dustin loves to eat steak and we just don’t eat it that often. 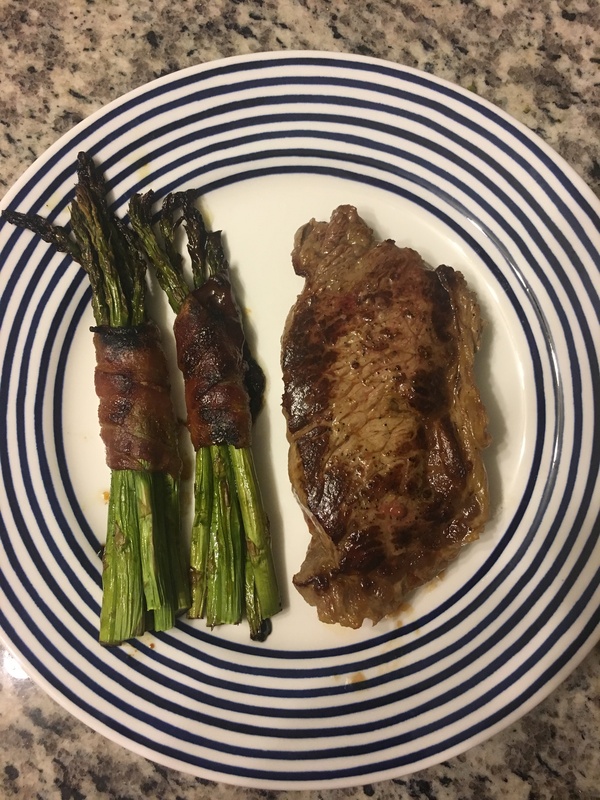 This year, our last in our apartment, I made NY strips in the cast iron with bacon wrapped asparagus. It was SO yummy! Because we don’t have a grill (hello, apartment living), cooking meat can sometimes be a challenge for two people who love grilling. I have used this cast iron skillet recipe a few times and it is by far the closest thing to grilling that I have found. Start by heating the oven to 400 degrees and heating your cast iron skillet to medium high heat. Brush your steaks with olive oil and rub in coarse sea salt and pepper on each side. Once your skillet is heated and lightly smoking, add your steaks and sear for 3 minutes on each side. This will be smoky, so make sure to have your vent fan on high. Once seared, place the pan directly in the oven for about 6 minutes. Dustin and I like medium rare steaks, so you can adjust your time based on how you like it cooked. Once the steaks have reached your desired temperature, take them out of the oven and put them on a plate to rest for about 5 minutes. When deciding on a side dish I knew I wanted to make a vegetable and I had some extra bacon in the fridge. Bacon wrapped asparagus would be perfect! It’s certainly not the most healthy side, but it was delicious. Start by heating the oven to 400 degrees. Cut the ends off your asparagus and grease your baking dish. Divide the asparagus into bundles of 5 or 6 pieces and wrap them in bacon. Place the bundles into the prepared baking dish. In a sauce pan combine butter, brown sugar, soy sauce, garlic powder, and pepper over medium high heat. Bring the sauce to a boil while stirring frequently. Once boiling, pour the mixture over the asparagus bundles and place in the oven for 20 minutes. Next, switch the oven to the broil setting and broil for about 2 minutes. Remove from the oven and cool before serving. I’ll share the full recipe over on the recipe tab! This meal was perfect for Dustin’s birthday and was very easy to prepare. Overall it took about 40 minutes and its as absolutely delicious! What are some of your favorite birthday meals?